Fiori Tiles are nice – I just haven’t had the time to learn about them yet. I primarily code in ABAP. So I used a transaction in the Fiori tiles. I did not really program in them. I started with a good old friend ABAP ALV. Then tried to print on one page in landscape and had too many fields. ALV doesn’t word wrap very easily. First off I’m on Netweaver 7.5 / HANA on-premise. Plus one long time developer in ABAP. ALVs are wonderful things. (See your system / SALV*Demo*) They cut development – well about in half. They provide a nice UI. They work great with Fiori Tiles. They are easy to implement. A quick development trick for those of us just learning is to write the program is attach our code to the Fiori Tile via a transaction. It’s very nice if you need to get something done yesterday. This PDF gives great instructions on how to do that. Cool right? I’ve attached my transaction to a Fiori Tile. Amazingly it looks nice. OK next on the agenda is printing. The requirement was to print everything in Landscape. There were a lot of LONG fields. The ALV wouldn’t print entirely in landscape. Or rather it would – but in very tiny letters. I couldn’t limit the fields – that wasn’t an option. So I posted here on the sap community. I love this place. The suggestion was to use ABAP2XLSX. Seeing that and NOT reading the complete answer, I proceed to change my program to display in Excel. I’ve used ABAP2XLSX before and it is a lot like ALV. However their are many benefits to Excel. The one I had to have was the ability to wrap text. In the ALV I couldn’t wrap the text easily. So I began to change my program over to ABAP2XLXS. 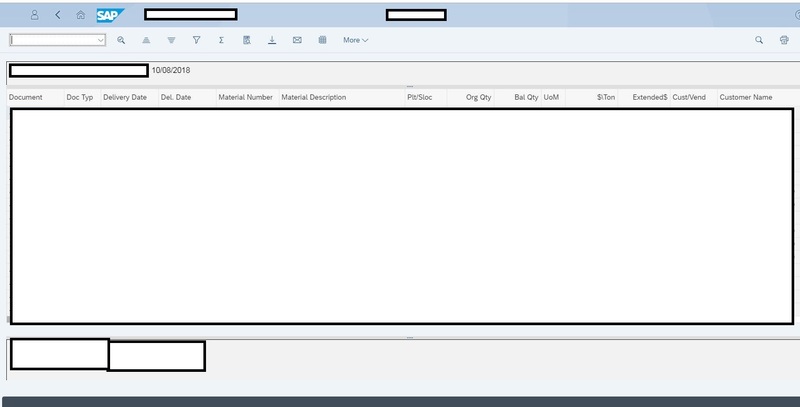 Do you know Excel doesn’t play well with Fiori Tiles? I didn’t. If I had read the entire answer, I would have known that. At this point, I could just put a button out there for download into Excel. (My second program). But I really didn’t like that option. So I thought about it. Aha – I thought, I’ll let them send via e-mail. That’s what he really wanted anyway. They wanted to be able to hand a list to different people. Back to a quick search. I could probably have done this one myself. But why do it if someone else already has right? I found this blog. And that really cut down on development time. The application is on a Fiori Tile. It displays in ALV. It is simple to send it to the people you want to see it. Or send it to yourself, edit and send out. This is much better than the Excel download. Word wrap, colors, and more… It looks nice. Yes, I’d like to have done more. But I’m on to my next project. Please comment – there are probably better ways to do this. Also if I get enough requests, I’ll try to put my very first project into GITHUB.